Flexiscreens will keep you young and cheerful. On the Cruising Guide to New Caledonia we have a special section on staying healthy while cruising in the tropics - what to do and what not to do. One of the important things you should not do is get bitten by mosquitoes - or stung by mud wasps, eaten alive by gnats, or annoyed by flies. The mossies are by far the most dangerous as in New Caledonia they can carry several species of blood viruses called Dengue Fever. Of course these dangers and annoyances are common anywhere you will be cruising so having a first line of defense is really mandatory. Coming from south Florida I knew this when I first bought the Moira in 1976 and I had screen drop slides made to fit by the boat yard in Taiwan. 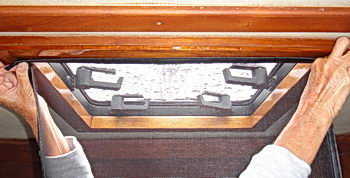 I've changed the screens a few times over the years but the teak drop slide in this image has protected us for 40 years. Since we live in the tropics and the mossies can be really dangerous we have always put in the screens at dusk - without fail - even if we have not seen or heard any mossies there before. It's a habit. So it has to be easy to do. The opening hatches and portholes also need screens. 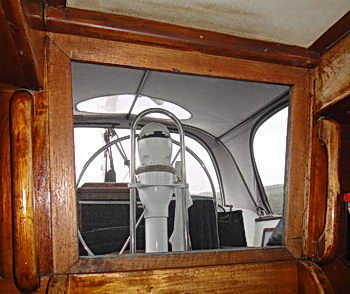 At first we had teak framed screens that plugged in to the hatch opening. But these were heavy, difficult to store, and if it started raining in the middle of the night there was a danger of accidentally dropping the screen on our heads when we opened it to close the hatch. Well, more than a danger actually since I really did drop it on Freddy's head once and she claims she still has the scar. Some 10 years ago I discovered magnetic screens and although they were expensive I got a set for all three of our hatches. They have a flexible magnetic rubber frame that sticks to a magnetic strip that is attached to the frame of the hatch. They worked fine but there were some problems. For one thing the magnets began to get weaker and the screens would sometimes drop out with a strong gust of wind. Even worse, when we had to close the hatch quickly (because of rain) the whole screen inevitably dropped off and needed to be put back. Not big issues, but after 10 years the magnets were not holding all that well. 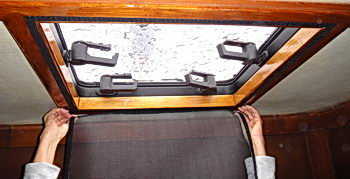 The magnetic screens also needed to be kept in place - or stored perfectly flat or they would take on a "bend" and not hold anymore. Then I happened to find www.flexiscreens.com. 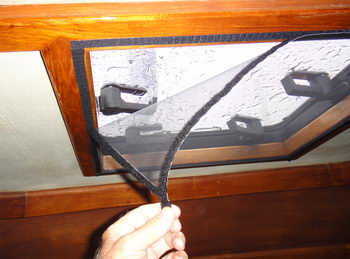 Flexiscreens are held onto the hatch frame using Velcro. They are slightly less expensive than the magnetic screens and have some interesting advantages. First of all, you can order them easily on the website and they take Paypal for payment. Whenever possible I pay with Paypal - it's quick, nobody but paypal knows my credit card details, and I never get that annoying "credit card rejected" from overcautious websites. Flexiscreens was fast - the screens I ordered were in the mail in a couple of days - of course the postal system took it's own sweet time getting the screens all the way from Australia to Noumea (two weeks) but when they arrived I was pleasantly surprised to discover the screens were of very high quality, strong, well made, and a perfect fit. Here is the screen out of the package. 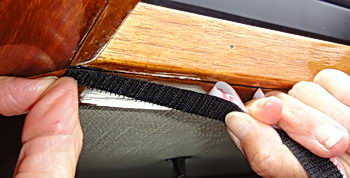 The coil of Velcro "hook" tape has a plastic backing to protect the sticky surface. Freddy measures the new screen to see exactly where to put the anchor tape. The surface has to be smooth and clean. Freddy removes the plastic backing as she tacks the anchor tape in place. Next the tape has to be pressed solidly to be sure it adheres everywhere and there are no bubbles. The Velcro sticks well and you don't want to pull off the anchor tape when removing the screen. We used a roller that we use for patches on the inflatable and other jobs aboard - but a spoon or plastic spatula would work OK.
Once all four sides are in place and rolled tight the screen is easy as can be to put on. 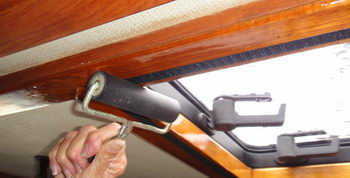 To open or close the hatch - or to lock it when leaving the boat - all we need to do is pull down one corner like this. Bliss is not having the whole thing flop on your head in the middle of the night when it starts to pour. And, come to think of it, there is a good chance that the mossie which has been patiently sitting on the screen over our heads at night will not be able to get in if we just open one corner and quickly close the hatch and reseal the screen. 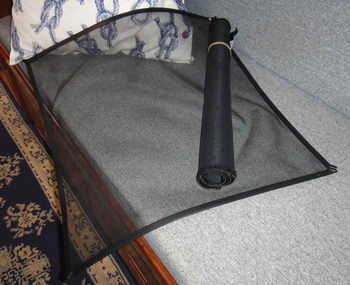 And unlike the magnetic screen shown here for comparison, flexiscreens can be rolled up to stow out of the way when they are not needed. Although we are not likely do do that because we ALWAYS put the screens in at dusk. So for all of you looking for happiness, health, and great nights while cruising - head over to www.flexiscreens.com and order your screens right now. Don't leave home without them. The Cruising Guide to New Caledonia has a special section on how to stay healthy while cruising the the tropics. This could literally save your life and if you download the cruising guide and read the section on staying healthy while cruising you will most assuridly make your cruising safer and happier. This one feature of the Cruising Guide will earn back what you spent for it if you can avoid a visit to a hospital or a doctor.